Jeez. It looks like you should be in traction, not typing! Wow! Is that you? What dedication! Have you tried Dragon Naturally Speaking software? David Pogue raves about it. Beau...rest up and feel better soon! We admire the dedication, but would rather have you around for the long haul! Ah, man. That looks painful. Excellent way to said the truth through one picture. I hope you can still doing this. I mean, posting and searching useful things to share. I really appreciate this kind of information. Bad advice for your part. 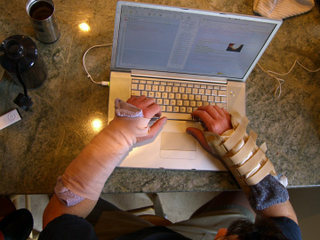 We can't ignore tendonitis and play on. We could damage our cartillages. I have to agree that you shouldn't ignore tendonitis. You should also visit optometrists to check if you have a computer vision syndrome since you spend hours in front of your laptop. You have a lot of nerve cuz I broke my hand some months ago and I couldn't write and not even going to the restroom. That looks painful. What happened bro? I think you should give your hands a rest until the cast is taken out.